I heard about Godfrey months before we ever met. He was living in Irepetra, the most southern city in Europe on the island of Crete, but our mutual friend Robert Kirkland knew that we would hit it off. Little did he know that we would be making a spiritual sojourn to Athos, the last surviving remnant of the Byzantine empire. A rocky, mountainous peninsula, inhabited by monks and spiritual teachers in a setting that has remained unchanged for over a thousand years. According to tradition, the Virgin Mary and Saint John the Evangelist were on their way to Cyprus to visit Lazurus when they ran into a storm that blew them way off course. They landed on the shores of Athos and Mary was so overwhelmed by the beauty of her surroundings that she asked her son (Jesus, for those of you who haven't read the bible or watched television) to give her the mountain even though its inhabitants were pagans. In response a voice was heard saying: "Let this place be your inheritance and your garden, a paradise and a haven of salvation for those seeking to be saved." She assumed that meant she could have the place. No one knows when the first monasteries were built but some of the Athonite monks claim Constantine the Great as the founder of several. 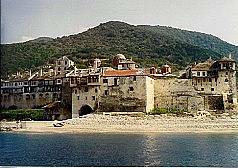 It is reported that monks from Athos participated in the council of 843 convened by the empress Theodora to discuss restoration of holy icons. In the tenth and eleventh centuries there was a great influx of monks and that was when many of the larger monasteries were built. Many of these were destroyed by pirate raids and it was during this period that every female (human or animal) was forbidden entry to the mountain. The famous 'No Chicks Allowed Rule'. During the Turkish occupation, the monasteries were recognized as a separate state and became a haven for intellectuals and academics. It is credited with the preservation of much of the Greek culture that once again took root after the fall of the Ottoman empire as men of high intellectual and spiritual caliber came down from the mountain and spread throughout the country, serving as teachers and preachers, encouraging the Greeks to remain faithful to their ancestral traditions and paving the way for the rebirth of Hellenism. Nowadays there are twenty inhabited monasteries, though their populations have dwindled. Monasteries that once held several thousand monks now count twenty or fewer inhabitants. There are also Sketes, which are sort of colonies of the larger monasteries that are smaller and easier to keep up, and then there are scattered communities comprised of houses called Kellions, each with a church. Beyond that are a few areas where monks and hermits live in stone huts or caves on nearly inaccessible ledges and cliffs. 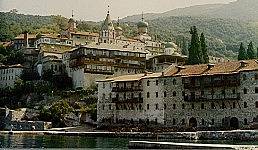 The monasteries are inhabited by orthodox monks from Russia, Serbia, Bulgaria but mostly from Greece. But we didn't know or care about any of that stuff. We just thought it would be a cool place to visit, and I have to hand it to Godfrey. If he hadn't prodded me, I might have never gone up to the holy mountain, despite the fact that my cousin George had been living up there as a monk since the early seventies. So when Godfrey and I met in the Plaka, the old city of Athens, in the shadow of the Acropolis, Mount Athos was where we decided to go. Athos is treated as if it is a nation in itself, kind of like the Vatican except instead of being in the middle of Rome, it's out in the wilderness and very difficult to get to. I remember reading about the Hunzas, who live in a remote valley in the Hindu Kush mountains and the only way to get to this valley is by trekking for days over dangerous snow covered mountain trails or by an airplane that flies between the craggy peaks with only inches to spare between the tips of the wings and the mountain cliffs. Depending on the season your chances of survival are reasonable to slim. I suppose that's how you keep nice places from getting spoiled. You put them where the difficulties of the journey make it not worth the trip for all but the most strongwilled and adventurous. Or in the case of Mount Athos where they send people first to the American Embassy, (if you are an American), and then to the ministry of Foreign Affairs for a beauracratic nightmare that makes you long for that icy trek through the elements. The US Embassy is as much a deterrent as any snow-covered lion-guarded mountain pass. A few years ago it was surrounded by green carpet grass and beautiful fountains. Built in the days when America symbolized freedom and hope, its grounds had a welcoming look, like you could even go there for a picnic. However, after the fall of the Junta, Greeks saw the embassy as a symbol of the tyranny that had fallen over the country for 7 years and in fact, blamed the CIA for the fascist dictatorship that had "saved" the country from communism. Now, twelve years later, the US embassy was surrounded by a ten foot high steel fence, police with sub-machine guns and bullet proof glass. They had turned the fountains off but that didn't matter cause you couldn't see them anyway. It was a fortress and this is where we had to go to get permission to visit what to many is considered the Holiest place on Earth. Because we were Americans we didn't have to get in the line of people awaiting visas that stretched down the block and didn't seem to be moving at all. These were students and people who wanted to visit family in America, and as the plain clothed guards motioned us through with their Uzzis, I felt like a traitor. We were led to the inner sanctum, past well-armed hired security and finally to a US Marine guard sitting in a booth with glass so thick he had to use an intercom to talk to us. We were sent to a few different people, questioned, given a paper and sent on our way. The Greek Ministry of Foreign affairs was a little easier. It was an old neo-classical building with high ceilings where everything echoed and nobody knew what we wanted. Eventually we were given a four day visa to visit the Holy mountain. We had flown to Thessaloniki rather then take the train. We didn't want to spend the money, but we wanted to get there and not be burnt out. We flew a domestic Olympic flight; as we touched down all the ceiling panels fell on our heads. We would have left that night for the village of Ouranopoulos, the last town before the frontier that separates Athos from the rest of the world, but the only way to go was by taxi and that would have cost as much as air-fare back to America, so we decided to hang out in Thessaloniki. We found a cheap old hotel and had dinner in some dive of a restaurant near the waterfront and then walked down to the hip section of town where we had a beer and listened to seventies rock music in a sleazy bar. We made a decision to not get too sloshed so we could be on our best behavior tomorrow when we went to the Holy mountain. We went to a really terrible movie starring Anthony Quinn - who played a shepherd leading a group of refugees across a mountain range in the Spanish civil war. We both agreed that it was the worst movie we had ever seen and I tried to talk Godfrey into writing a rave review, just to see if anybody was paying attention to his weekly ramblings in the Spectator, but as far as I know he never wrote it. We went back to the hotel and got an early night's rest for the big journey the next day. It was a four hour bus ride to Ouranopoulos, over mountains covered in pine trees and through small villages. The last half hour was along the coast. We made our way down the peninsula when the road came to an abrupt end in the village. Beyond the village was a series of twisted goat paths through ravines, mountains and valleys. 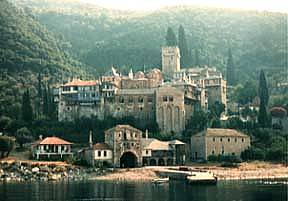 The only legitimate way to get to Mount Athos was by the small boat that left every morning at seven, filled with pilgrims and priests and returning monks and workers. From this point on there were no women allowed. Ouranopoulos was the last stronghold of feminine life and this thought crossed my mind as we sat in a small cafe eating dinner. I looked around at the last women I would see for four days. It suddenly occurred to me that I had never spent four days without seeing a woman, or even one day. I could feel the first pangs of panic start to spread like waves through my consciousness. I looked around, suddenly desperate for female companionship on what seemed like my last night on the planet earth. Godfrey went back to go to bed while I prowled the dusty streets for a good twenty minutes before giving up. The next morning we were up at six. Before we were totally awake we were aboard the boat to the port of Daphne, the entry point for anyone coming to Mount Athos. The boat stopped first at the nearly deserted Saint Panteleimon to leave some supplies for the few remaining monks at this giant city of a monastery. We arrived in Daphne and joined the mad rush off the boat. We were ushered to a table to have our papers checked and dated by several official looking monks and then pointed toward an old bus that was waiting for us. Everyone was a monk. Even Godfrey was dressed in black, and I felt strangely isolated, but at the same time thrilled, to be somewhere so different from anything I had ever known. The old bus started its engine and we were off on the dirt road that climbed back and forth, gradually making its way up the lush wooded mountains. After a half an hour we reached the administrative capital of Karyes, a small village with a cafe, and a store that sold everything that a monk could possibly need. It was at this point that we decided to find my cousin. We didn't know what else to do or where to begin. We asked several monks and finally one of them told us, "Yes I have heard of him. Father Theodore, as he is called, is at the Skete of the Prophet Illias not far from here. It is called the American Monastery." He pointed us in the right direction and we set off to find my cousin George, now known as Father Theodore. 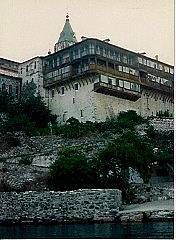 Not far from here is a relative term in Athos where monks walk everywhere. Not far could mean a mile away or it could mean hours away as it was in our case. After walking for an hour we came upon a small cluster of houses and decided to ask directions. We picked the friendliest looking house and I knocked on the door. We were met by a very old monk with a long white beard who beckoned us in and sat us at a small table. As we discovered for the first of many times that day, it is customary to greet all visitors with a large glass of clear mountain water and a small glass of even more clear "Tsipuro", which is like Ouzo without the licorice, only a lot stronger. Monks don't get visitors very often, in fact that's sort of the point of being a monk and this is especially true of those living in the houses scattered around the wilderness, away from the monasteries. However, when they are blessed with a guest, especially from the outside world, they want to know everything and they want to keep you there as long as it takes to hear it and that is where the Tsipuro comes in. By the time we left the little house, we were staggering through the woods and the directions he gave us might as well have been in Turkish. I remembered being told about following the dirt road and this is what we did until it split and we were forced to make a decision, the high road or the low road. We chose the high and followed it up the mountain for a couple hours. It was hot and we were thirsty and irritable and all I wanted was to find the Skete of the Prophet Illias. I remembered that usually they name the churches on the highest mountains after the Prophet Illias, so as long as we were going up we were on the right track. Unfortunately I was wrong and what we were following was a logging road that came to an end in a clearing in the middle of a pine forest. We had no choice but to turn around and go back to the main road near Karyes. When we got to the main road we met another monk leading a donkey. He was easily eighty years old and we talked about his years on the mountain. He couldn't get over Godfrey and kept asking me in Greek, "Are you sure this is a boy? He looks like a sixteen year old girl". To anyone who knows Godfrey, that gives you some indication of just how long the old man had been on the mountain. By no stretch of the imagination does Godfrey look like a sixteen year old girl unless you've spent so long thinking about it that everything looks like sixteen year old girls... trees, rocks, grizzly bears and Godfrey. No matter, this old monk was convinced and when we finally reached the point where our paths parted , he kissed me once on the cheek and would probably still be kissing Godfrey if I hadn't pulled him away. Godfrey was not shaken. He thought it was just a custom. The old man had left us with these words, "Turn left at the cross". It seemed simple enough until we looked around and realized there were crosses everywhere. Back in the real world, well in Greece anyway, there are crosses by the side of the road that are little shrines that commemorate accidents or near accidents. If a truck driver is racing down the road and goes into a skid heading for a hairpin curve and a five thousand foot cliff, he is praying..."Holy Mother of God, if you let me survive I will build a shrine for you on this spot". If he survives he builds one, if he doesn't, someone builds one for him. Either way there's a shrine and somebody regularly comes around and fills a little flask with oil or lights the lantern or leaves something useful to some poor unfortunate traveler. That's what we were looking for and it took us a while to realize that someone, or everyone, had made crosses out of sticks and put them everywhere. "The old man has tricked us", we thought, Godfrey pointed out the similarity between this and the cemetary scene in 'The Good, The Bad And The Ugly'. Luckily we came upon another house and though we were a little reluctant to face any more Tsipuro, we realized we had no choice and entered the gate. We were in luck because this time the monk was a young one who was working in the yard and really didn't give a damn about the outside world. He talked to us as he worked and gave us directions. "Take a left at the cross in the road". As we were leaving he said to me, "Why do you want to go back to the outside world. Why not stay here?" I told him I was thinking about it but that I would miss women. He laughed. "You would not miss them. You would have everything else. You would have this beautiful land and you would have God." A few yards further down the road was a large carved wooden cross. The old man had been telling us the truth. It marked a path that led off to the left and we finally felt like we were getting somewhere. We were both getting tired and Godfrey was starting to fall behind, so I was the first to see the Skete of Proffitti Illias, rising out of the mist like some magical land of Oz. It was a dream or a scene in some fantasy cartoon movie and I watched and waited to see the look on Godfrey's face when he saw it too. It was like a small city in the middle of an enchanted forest, surrounded by thick walls with the spire of a church rising from the center of it. We quickened our pace and in a few moments we were ringing the bell in the courtyard, letting the monks know that visitors had arrived. We were met by two monks in their late thirties. One carried a tray with two glasses of water and two glasses of Tsipuro. We spoke in Greek and I told them we were looking for my cousin. The light haired monk told me that Father Theodore used to live there but had moved up in the hills to a Kellio n, a house with a church attached where several monks live. He told us the Skete of Profitti Illias was part of the Russian Monastery of Saint Pantokratoras. I thought it was strange then that the monk in Karyes referred to it as the American Monastery. "And where do you come from?" He asked us again in Greek. I told him we were from America. A place called North Carolina. "I don't believe it", he said in English. It wasn't what he said, but how he said it that took us by surprise. He said it like an American. In fact he was American, from Brevard North Carolina where his father was a Baptist minister and a neighbor of Billy Graham. He had been on the mountain for sixteen years. He took us into the dining room and fed us some canned vegetables. The monks had eaten just before we arrived and there really wasn't much food, but we were happy and we told him all that we could about what was happening back home in North Carolina. After dinner he gave us a tour of the monastery and as it got dark we sat on the wall overlooking the forest and the sea beyond, talking about monastic life and the spirit. He showed us to our rooms. There were services every morning at four, but they were not obligatory for guests. We decided to skip the service, but to this day I wish that I had gone. There was another guest at the skete that night and we spoke to him in the refectory. 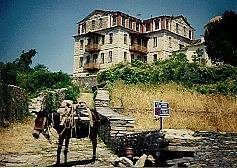 He was a German who had been coming to Athos for a number of years. He had been in Greece during the war as part of the occupying army and was now returning in peace. We spoke to him for awhile, but he wanted to do all the talking and Godfrey and I were soon irritated by his arrogance. I tried to steer the conversation to spiritual matters but he waved me off. "I'm not interested in that", he said.
" Then why are you here?" Godfey asked. "I come to see the treasures that are in every monastery. There's a fortune of gold on this mountain." The next day we had breakfast with our friend from North Carolina and left through the heavy wooden gate that the monks had closed at sunset and opened at sunrise. We followed the path that led through the vegetable gardens and orchards and down the mountain alongside a small brook. After about twenty minutes we had to stop to catch our breath. Not that we were tired but because it was so beautiful. It was a warm sunny morning and we were in the most beautiful surroundings one could imagine. Colorful dragonflies buzzed around us and butterflies stopped to gently flap their wings on the banks of the stream. It was the kind of place they tell you to imagine when you listen to a guided meditation tape. There was magic in the cool sea breeze and I felt a kind of joy that reminded me of what it was like to take LSD before the world became such a serious place.